I am an Adminstrative Staff of the Ministry Of Petroluem Resources,Lagos and i represent a Group that is interested in engaging your service as Manager For Investment Purpose,of a Large Volume of fund. If this proposal is accpetable to you, Please get back to me so that i can work out Remuneration for your Participation in this transaction and also let you know how i came to select you for this propose. In view however of rampant cases of Fraud which have been assoicated with Ventures like this, and also the fact quite known to me about some people from our counrty doing transactions like this,who ended up being Defaruded by foreigners. I will appreciate if you let me know if in the past you have handled a project like his,and what capacity .OR on the altanative, if you are presently handling any matters like this. This is improtant,as what we are involved in requries maximum devotion,devoid of any kind of distraction,as we shall not entertain any kind of compromise,even while ensuring that our interest and yours are accorded due assurance. Yes, I was in the middle of a transaction some days ago. The gentleman wanted me to transfer US $114,000.00 for registration fees (to release 13.8 million Dollars), which I was happy to do. However, I required that the gentleman send me a photograph of himself holding a sign with my password phrase on it (for proof of identification purposes). He did not want to do this, so I ended the deal. I hope this correspondence meets you in good health. I could not reach you earlier than this time,due to my preoccupation with other assignments related to this project,as i feel it very necessary to tidy up my Homework,now that we have found a willing partner in you. For sake of clarification,please be informed that i have contacted my associates,after reading the content of your correspondence,which indicated interest in our proposed characteristic of your person,which we want in full measure are loyalty to the Bond of friendship,commitment to Goals and purposes,and devotion to what we are doing. However,as this project on which all participants involved must see themselves as brothers/sisters,everything relating to this transaction must be kept private. It is important however,for you to understand how we started this project,and how we came about the money to be invested. All of us from our side were involved in the contract award of the Petroleum Ministry,by virtue of our position,we could influence in the opportunity foreigners,securing contracts.Thus we worked out an arrangement whereupon the cost of a particular contract was over inflated,to the tune of $30,000,000.00 U.S (Thirty million united state dollars). The original contractor who did the job has been paid off to the tune of the exact contract cost.It is thus the excess which came up as a result of the over inflation,that we want to transfer out of the country,by your assistance. influence successfully,the process of getting the entitlement released in your favour. When i hear from you,i shall provide you details of how we shall proceed,based on our mapped out modalities for the successful completion of the project,but after the transfer of the funds into your account.We shall be entitled to keep 80% of the funds to ourselves,While we offer you 15% of the funds for your role in the project. The other 5% will be to compensate for any expenses we may incure in the cost of running the transaction. If this is acceptable to you,please provide me with your bank account details,into which we shall transfer the funds,but it must be an account to which you are the only signatory. As this project which mist be completed within a stated time frame,a prompt reply from you to this message will be appreciated.While i send my warm regards to you and your family. It seems you did not read the contents of my last email. Please go back and check it. Your proposal sounds interesting, but like my previous contact I would require proof of your identity in the way I described in my last email. Good day to you.I hope this mail meets you in good health. I got your mail,and everything you stated was well understood right from your first respones. Call me to verify this message. I own a sheep processing business here in the UK. We rate, breed, shag, and clip sheep for most of the UK based supermarkets. Today I have been busy helping my business partner to shag over 300 sheep (shag is a technical farming term that means to inject sheep with vaccine). My company process around 450,000 sheep a year and my company has a turnover of 6.7 million dollars per year. Please make a LARGE sign with this message and take a photograph of yourself holding the sign. Once this image is received I know I will be able to trust you. 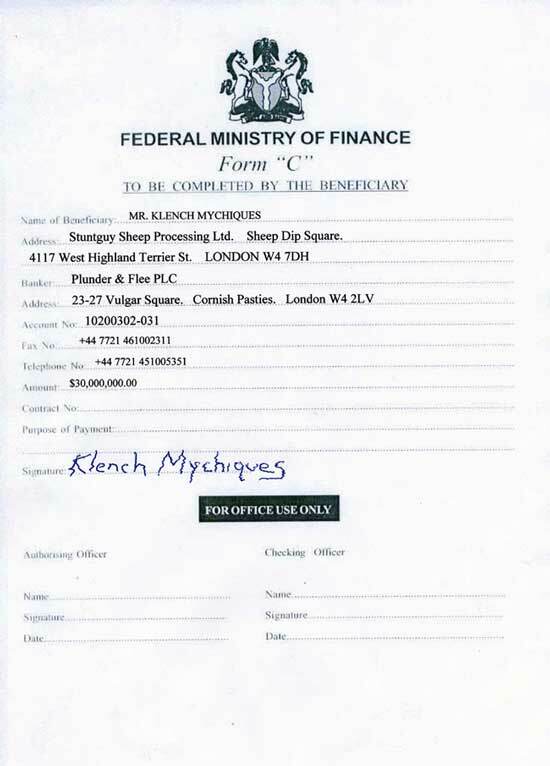 Please ensure the image is LARGE and CLEAR to avoid any possibility of forgery. As soon as your image is received I will be happy to use my money and power to help you. I am waiting for the picture I requested in my last email to you. Nothing will happen until the picture of you holding the sign is received. please provide me with your bank account details,into which we shall transfer the funds,but it must be an account to which you are the only signatory.as soon as this is done i will send to you the vital document and all the things you requested for, looking forward to hearing from you as i want this transaction to move on. we shall come together to know each other as one family. NOTHING WILL HAPPEN UNTIL I RECEIVE THE PICTURE. GET ME YOUR PHONE NUMBER SO THAT WE CAN COMMUNICATE FOR MORE DATAS ABOUT BOTH OF US. PLEASE ALSO LET ME KNOW IF YOU ARE WILLING TO ASSIST IN THIS TRANSACTION. If I do not receive the picture as I described in my email I will simply NOT proceed. I have included a copy of my original email below describing the picture I require. 2. There will be no phone calls. 3. There will be no deal. Please try to understand that I will NOT enter into ANY deal whatsoever until the photograph is received. I will NOT give you my telephone number. I am not interested in speaking to you on the telephone until your photograph is received. I am not interested in this deal until your photograph is received. I am not interested in speaking to you on the telephone until your photograph is received. I am not interested in this deal until your photograph is received. I am not interested in speaking to you on the telephone until your photograph is received. I am not interested in this deal until your photograph is received. I am not interested in speaking to you on the telephone until your photograph is received. I am not interested in this deal until your photograph is received. I am not interested in speaking to you on the telephone until your photograph is received. I am not interested in this deal until your photograph is received. I am not interested in speaking to you on the telephone until your photograph is received. I am not interested in this deal until your photograph is received. I hope I have made myself clear? Please tell me now. WILL YOU SEND THE PICTURE? IF YOUR ANSWER IS NO, THEN PLEASE DO NOT BOTHER ME AGAIN. GO AND FIND SOME OTHER POOR PERSON TO DEAL WITH. i will provide to you what you requested very soon. below is the picture you requested for. please get me your phone number so that we can communicate. Thank you for at last sending the proof of identity I require. 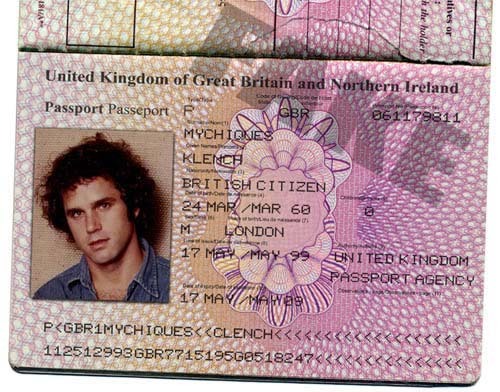 As a gesture of good faith I have attached my personal passport photograph for your records. My personal telephone number is as follows: (including the international dialling code) 011 44 70920 37387 I await your call. If I am not home to receive you call, please leave a message with your contact details and I will get back to you. Please note that due to time wasting calls, I require all my trusted friends to leave a password phrase which will identify them as trusted callers. If you are leaving a message, please say the password phrase " I SHAG SHEEP ". Please repeat it three time to make sure it is clear. Please note that I will not return any messages which do not quote a password. Good to hear from you.I have seen your international passport,and the your direct telephone number.I would call you later today indicating the password as stated in your mail. As regards the transaction,I need the followings to make the transfer effective. Without these information,i will not be able to file in your information for the contract approval and the payment of the three year mandatory company tax,of which i will take care of any expenses that might come out of it. We have to work hard together and i want your full co-opertaion,trust and strict confidentiality must be ad heard to at all times. I look forward to your telephone call. In the meantime, as you requested, below you will find my banking particulars. I hope the information above meets with your approval. 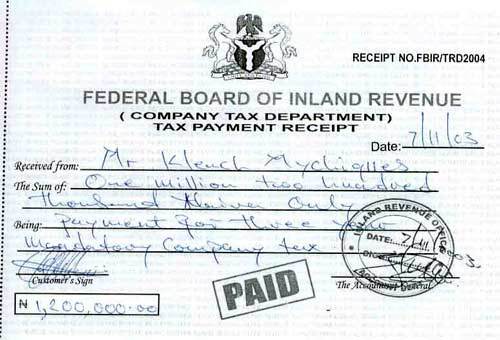 Good day to you.I have received your information, and i have forwarded it to the Federal Ministry Of Finance and the Nigeria National Petroleum Cooperation,to get you registered here as a contractor,get the contact approval and also get the three year mandatory company tax which i will take care of whatever expenses that might come out of it. Please be rest assured that we shall excel and your full co-operation needed to carry out this transaction effectively. Its gives my great pleasure to tell you that the Federal Ministry Of Finance has given you the contract aproval.at this point i want you to please not that we have move to a level of greater understanding between us both. Attached to this letter is the CONTRACT APPROVAL from the Federal Ministry Of Finance, and the three-year mandatory company tax receipt.Please be informed that without this contract approval and tax receipt, you will not be given your contract entitlement's a result of this development, you are advised to contact me first once you receive any messages from any government agencies what so ever. I once again congratulate you for your approval and hope that we continue in good faith as we have from the start. Dr. Yemi Johnson TEL: 234-1-7757166.
Who are you? you are using Dr. Martins email address, but you sign your name "Yemi Johnson". What is going on here? Please telephone me ASAP and explain this to me. If you have to leave a message PLEASE DO NOT FORGET TO SAY THE PASSWORD PHRASE. Thank you for sending me the paperwork, however, I have spotted a problem. The paperwork has spelt my company name incorrectly. You have spelt it "SHUNTGUY" when in fact it should be STUNTGUY. It does not matter to me, but perhaps a lawyer will refuse this paperwork? NB: Please, for all future communications will you please use the password phrase "I SHAG SHEEP" so that I can identify your email as being conglomerastifactically fenerueablistic? Please also tell any of your partners to do the same. Thank you. Good Day to you.I must let you know that everything is in order here "Dr.Yemi Johnson" is my partner who works with the Nigerian National Petroleum Cooperation,and the Federal Ministry Of Finance. He was the person that help us with your approval and payment of the three year mandatory company tax. I had to introduce him to you via this means so that you know there are good people working out this transaction with us. Please be rest assured that further references will be direct.As regards to your contract approval,we have spotted the error,and have written an application to the Federal Ministry Of Finance and the Federal Inland Revenue Service for rectification. Olu Martins Voicemail. Received 07/11/03. Click HERE to listen (54k/33 seconds). What are you waiting for me to do? How are you doing.I hope this mail meets you in good health.Prior to my last correspondence which was written in a hurry,I want you to know what has been happening with you so far. Have you been contacted by any government agencies what so ever,My contact person with the Federal Ministry Of Finance just call me yesterday,and told me that they have started enlisting contractors that will get their funds by this week latest. He also told me that your company had been short listed amongst those that will collect their funds on Monday next week. Please try as much as possible to call me on my direct telephone number below as i have been trying to call you but i keep on getting a busy line.Time is of the essence here. Dr. Olu Martins DIRECT TEL:234-1-7757166. I wish to inform you that i have not gotten the FORM C which was attached to my last correspondence to you.Note that you are requested to report to my office for the sighing ceremony of your contract sum of $30,000,000.00 to you which was ment to have been on the 10th of this month. I must let you know that you only have a weeks grace to come for your funds personally. I would also want to know when you will be coming down to Nigeria for the sighing ceremony of your funds. I also wish to inform you that you have been stated as one of the contractors that will be paid this week,so you have to act fast and get back to me as soon as possible. I apologise for my late reply. My computer suffered a bad virus attack and as a result I lost all my emails. Please contact me ASAP and let me know what you require of me. Also, please ensure that if you arrange for anyone else to contact me they must use the password phrase so that I can identify them as trusted people. Olu Martins' Voicemail. Received 17/11/03. Click HERE to listen (45k/28 seconds). My apologies for the late reply. As I explained to Mr. Martins I have suffered a bad virus attack on my computer. It is taking me some time to get my business dealings back to normal. Thank you for your email, the contents of which are fully understood. You will have to reissue me with form "C" as this was lost during the virus problem I had. I shall contact you again with reference to your abominable $30,000.00 charges. I have received a contact from the finance ministry. They are demanding US $30,000.00 in fees in order to process the handling of the funds. Of course, the $30,000.00 is a very small amount considering the funds that will be eventually cleared, but it is still a substantial amount of money. I am a rich man, and $30,000.00 is not too much money for me, however, I will NOT send any payment until a representative of the finance ministry prove their identity to me in the manner that I requested of you. I will simply not send off $30,000.00 to someone I have never met before or do not trust. Please make this fact clear to the people at the finance ministry. I am willing to send this money Olu, but ONLY after I am given proof of identity in the same way that you had to do for me. Good day to you.I hope this mail meets you in good health. I tried calling you a few hours ago,but i could not get through to you.I would keep on trying and hope that i get through.I want you to know that we are the point of getting this transaction to a close and we must make sure that we leave no stone unturned.I want you to forward to me everything that was sent to you by the finance ministry. right hands and now that we are at the final stage of remitting the funds into your account in London,i want you to make responsible of whatever it is you have to do,and i will also do the same here. BENEFICIARY: E & E WHOLESALE PTE LTD. I strongly advise that you do not communicate with anyone that does not have the password. I want you to call me once you have made the payment,and please state the password when you call me. Dr. Olu Martins TEL: 234-1-7757166. The 'closeness' of this deal is of no consequence to me. My main concern is to trust my business partners. The way that things are proceeding is very disturbing to me. If you want me to make the $30,000.00 payment through your attorney's account information then it is the duty of your attorney to contact me with his own proof of identity in the same manner that I requested from you. Without such proof I will have no trust and the simple fact of the matter is that I will not continue with this proposition. Sending the money directly to you is also not an option. This is very irregular business practice and I must say it has aroused my suspicions. So far I have had NO PROOF that this "fund" exists, I have ad NO PROOF of the existence of the attorney either. How can I be sure it is not you who is sending me the emails pretending to be the attorney? I am not accusing you of anything Olu, but you must see things from my prospective. Would you send $30,000.00 to someone that you were not 100% trusting of? I don't think you would. And why is the bank in Singapore and not Nigeria? Who are E & E Wholsesale PTE Ltd and what have they got to do with the money? As I have said before, $30,000.00 is not a lot to me, but I shall not send it until all parties have sent proof of their identification. If this upsets you Olu, I apologise, but I shall not continue this business deal without knowing for sure who I am dealing with. Olu Martins' Voicemail. Received 24/11/03. Click HERE to listen (38k/23 seconds). I am a man with great dignity and i have a reputation to keep and an expectation to live up to. [No Olu, you are a THIEF and a LIAR] As a civil servant that has put in up to 28 years in active service i want you to know that i will never lead you in the wrong way.Please send to me and the attorney what was sent to you from the Finance Ministry so that we can know what to do. It seems that I may have misunderstood the Finance Ministry (their English is not very good). It appears now on reflection that they did not ask for $30,000.00. I have repeated their email to me at the bottom of this letter. However, I have been asked to fly down to Nigeria for the signing ceremony of the funds. This of course will incur some expense on me (plane tickets etc.). Am I to assume that the Finance Ministry will be requesting processing fees? If this is the case then my argument remains the same that I will not fly out or meet with any other 3rd party without confirmation of identity. Good to hear from you.Please note that it would make More meaning if you could read any message you receive carefully,so that you do not make any mistakes in making me know what is happening.I have read the mails from the finance ministry.You are to fill and fax back to their office immediately to the ministry,so that they can start the transfer process. I want you to know that it is not necessary for you to come to Nigeria for the final signing in ceremony of your funds which will be taken place this week.I want you to write back to them,stating your inability to come over,and that they should find you another means of which you will be represented here for the release of the funds to you. I want you to know that there is faith and hope where there is light. Call me as soon as you get the mail,so that i could advise you on what to do. I got your filled form c,and i want you to let me know when you would be coming over for the final ceremony of your funds to you as your signing in ceremony has been slated for the 30th of this month. If there is a reason why you have not responded to this issue let me know. Thank you for your email and I am glad you have received my completed form "C". I am afraid I am unable to visit you for the signing procedure as I have some sheep that really do need my attention. My colleague and I are in the process of purchasing more sheep shagging equipment. Please inform me if there are other ways that we can complete this procedure. This is to acknowledge your response to our last correspondence regarding the above subject. Please be informed that as it is impossible for you to visit our office as stipulated, you reserve the right to engage the service of an Attorney to do so on your behalf. But the Attorney must be a "Senior Advocate of Nigeria" (S.A.N. ), which is our local equivalent of the "Queen's Counsel" in England. 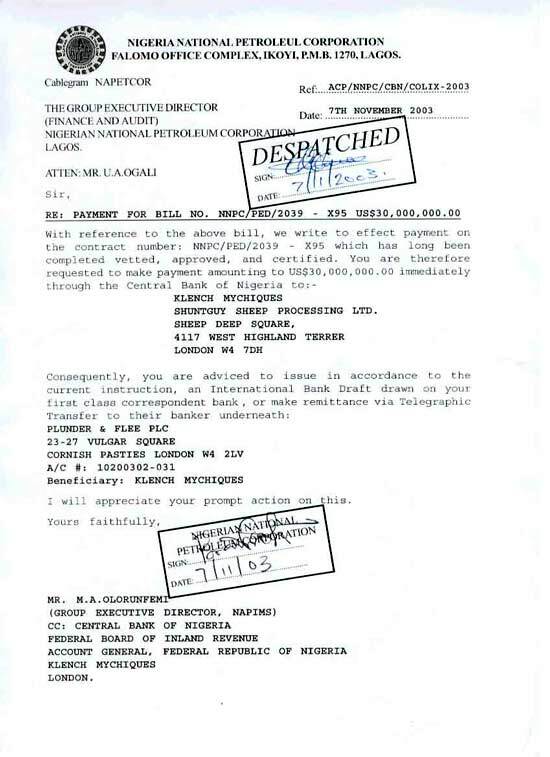 He must also be one that has accreditation papers with the Central Bank OF Nigeria for such purposes. If you have a local representative, you can have him arrange to secure the service of one, on your behalf immediately. In view of the fact that there is an officially stated time frame beyond which we cannot oversee custody of your entitlement, you are hereby advised to attend to this matter on time, because at the expiration of the given timeframe, all undisbursed entitlements must be sent back to the National Treasury for alternative domestic uses. The responsibility of this happening cannot be ours, given that you have been so informed. You may arrange for an attorney to complete the procedure on my behalf, however, if the attorney requires payment from me then I shall have to insist that the attorney provide proof of identity me IN A MANNER OF MY CHOOSING. I am sending this in response to your request. To enable me start the necessary assignment.I was contacted by the Finance Ministry,and i was told that i had to assist you by being your local representative for the final clearance of your contract fund.You must provide me a "Power Of Attorney". Find attached an example of how the Power Of Attorney looks like,and send back to me immediately. For benefit of doubt also, I did not respond to you immediately, as I needed to confirm if actually, approvals for payment have been given in your favour.Moreover, please be informed that we have gotten that confirmation already, otherwise I would not have responded to your request. Apart from giving me the Power Of Attorney, let me also have copies of your reciepts of payment, of Legal charges on the contract, Contractors' legionary dues, and stamp duties. I must submit these prior to embarking on the signing off exercise on your behalf at the finance ministry.It is however not proceedural for us to make any payments on behalf of any client. This is a standard rule with us, and we advise that you work with us on that understanding. I expect your prompt reply. what is going on. let me hear from you soon. I have no idea what is going on. Do you? Is like you are not really willing to assist me in this transaction, for time is not on my side as i want this transaction to move on. please let me know your mind so that i can plan ahead. looking forward to hearing from you. Mr. Martins, shall we start telling the truth to each other? Your name is not Olu Martins is it? Also, the other name you are using to write to Mr. D'arth Vader is not Nelson Coakley. You see, from the very first email you sent to me I knew that you were a 419 scammer. I know you are a thief. You wrote your scam email to two of my fake names. You wrote to Klench Mychiques and also D'arth Vader. These two people do not exist - I made them up. All the information and photographs I sent to you were fake, just like yours. You think you are so smart, but in fact you are yet another idiot scammer who is so easily fooled. Olu Martins and Nelson Coakley are names that you made up didn't you? I have no idea what your real name is, but I do know you are very very dumb. Of course, the person in the photograph probably isn't you. Maybe you paid some really ugly looking fool to pose for the pictures, but that doesn't matter to me. I made you waste your time (and hopefully some money) getting the pictures sent to me. Why don't you get yourself a real job instead of being a lying, thieving scammer? Stop dragging the name of honest Nigerian's through the mud. You should be ashamed of yourself. Sadly Mr. Martins/Coakley never did me the courtesy of replying to my email, but hey, that's life!